Papers: 1931-1934. 18 items. Political and business correspondence and photographs. Oral History: Discussed in interview with William Benton. Papers: In Geoffrey Parsons papers, ca. 1919-1959. Papers: Correspondence in Civil Service Reform Association records, 1880-1947. Papers: Correspondence in Frank W. Price papers, 1929-1949. Papers: In the Pew family papers, 1817-1965. Papers: Correspondence in Raymond E. Willis papers, 1936-1950 (bulk 1938-1947); and Will H. Hays papers, 1857-1954 (bulk 1914-1954). Papers: Correspondence concerning Diekemas appointment as ambassador in Geritt J. Diekema papers. Papers: 3 letters (May 11, June 14, 1933; August 23, 1935) in Seymour autograph collection, 1750-1945. 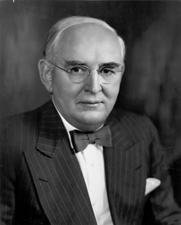 Papers: Correspondence in Henry Robinson Luce papers, 1917-1967; and Joseph Pulitzer papers, 1910-1958. Finding aid. Papers: Ca. 100 items (1927-1948) in the John Beukema papers relative to the establishment of the St. Lawrence Seaway; and miscellaneous items in the Kathleen Lawler papers. Oral History: Discussed in interview (February 1-June 13, 1984) with Francis O. Wilcox, chief of staff, Senate Foreign Relations Committee, 240 pages. Papers: Correspondence in Patrick J. Hurley papers, 1900-1956. Papers: 1927-1951. 8 feet and 25 volumes. Personal correspondence, diaries, speeches, clippings, 25 scrapbooks, political memorabilia, and portrait. Extensive documentation of foreign policy during World War II. Major portion, excluding scrapbooks, available on 11 microfilm reels. Finding aid. Also descriptions of social activities and daily political life in Washington in Hazel Harper Whitaker Vandenberg papers, 1928-1948. 2 linear feet and 2 volumes. Includes scrapbooks and diaries. Papers: Correspondence in Vandenberg family papers, 1923-1965, 1 linear foot; and 22 scrapbooks relating to Vandenbergs career, a complete file of Congressional Record remarks, press releases, and campaign literature in Ralph Lawes Smith papers, 1928-1961, 3 linear feet and 22 volumes. Additional Papers: Correspondence in John Wright Dregge letters, 1949, 1961; George Averill papers; Claude Halstead Van Tyne papers, 1885-1930; Frank Murphy papers, 1908-1949; Stella Brunt Osborn papers, 1916-1922; Shirley Wheeler Smith papers, 1881-1959; Alexander Grant Ruthven papers, 1901-1961; Chase Salmon Osborn papers, 1889-1949; George Murphy papers, 1911-1961; Jesse Sidall Reeves papers, 1853-1942; Louis Carlisle Walker papers, 1881-1963; Louis Webber papers, 1929-1955; Robert James Wilson papers, 1933-1950; Jeanette Wheeler correspondence 1946; Taggart family papers, 1860-1960; John Klaerr Walsh papers, 1928-1958; Universities Committee on Post-War International Problems records, 1943-1944; Isle Royale papers, 1933-1935; Rudolph Edward Reichert papers, 1907-1962; Charles Albert Sink papers, 1907-1985; James Kerr Pollock papers, 1920-1968; Blair Moody papers, 1928-1954; Wilfred Byron Shaw papers, 1900-1954; James Orin Murfin papers, 1896-1940; Ansel Brooks Smith papers, 1932-1962; Earl C. Michener papers, 1898-1934 and 1940-1954; Frank A. Picard papers, 1907-1963; Interlochen Center for the Arts records 1921-ongoing; John Butlin Martin papers, 1948-1965; Michigan Civil Service Study Commission records, 1935-1942; Frank McKay papers, 1909-1965; Howard Cyrus Lawrence papers, 1916-1966; Jay G. Hayden scrapbooks, 1916-1965; Clarence Cook Little papers, 1924-1929; Almon Watson McCall papers, 1924-1970; David Walbridge Kendall papers, 1932-1976; Patrick Henry Kelley papers, 1910-1924; Joseph Ralston Hayden papers, 1854-1948; Roy Dikeman Chapin papers, 1886-1937; Albert Joseph Engle papers, 1911-1959; Fred Warren Green papers, 1881-1939; Lucia Isabelle Voorhees Grimes papers, 1912-1949; John J. Carton papers, 1883-1921; Frank Dwight Fitzgerald papers, 1928-1944; Louis Convers Cramton papers, 1898-1966; Edwin Denby papers, 1880-1929; George Cushing papers, 1942-1955; WilliamByrnes Cudlip papers, 1922-1985; Prentiss Marsh Brown papers, 1902-1973; Gerald L. K. Smith papers, 1922-1976; Herbert F. Baker papers, 1904-1926; and various other collections. Finding aids. Papers: Correspondence in Everett Francis papers, 1933-1943; and James J. McClendon papers, 1932-1969. Papers: Correspondence in Charles Dewey Hilles papers, 1885-1955; and Charles Telford Erickson papers, 1908-1973. Research Libraries Information Network In addition to the institutions listed above, items are also cataloged in collections at: Harvard Law School Library, Cambridge, MA; Radcliffe College, Schlesinger Library, Cambridge, MA; State Historical Society of North Dakota, Bismarck, ND; Syracuse University, George Arents Research Library, Syracuse, NY; and University of Pennsylvania, Philadelphia, PA.